The Battle of Makassar Strait, also known as the Action of Madura Strait, the Action North of Lombok Strait and the Battle of the Flores Sea, was a naval battle of the Pacific theatre of World War II. 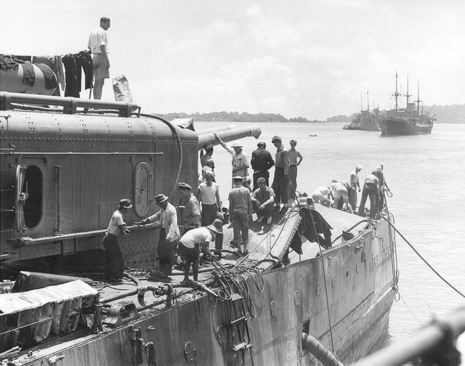 An American-British-Dutch-Australian (ABDA) fleet, under Rear Admiral Karel Doorman, was on its way to intercept a Japanese invasion convoy bound for Surabaya, when it was attacked by 36 Mitsubishi G4M and 24 Mitsubishi G3M, which forced the fleet to retreat. Japan demanded the delivery of raw materials, most importantly OIL from Sumatra. The Dutch administration complied; yet in March 1942 the Japanese invaded, occupying most of the archipelago (southern New Guinea escaped Japanese occupation). The Dutch residents, in total 170,000, were INTERNED, a Japanese military administration established; the Japanese partitioned the archipelago in three zones, Sumatra, the Central and the Eastern Islands; many Indonesians found employment in the new administration. Dutch was replaced, as language of administration, education and jurisdiction, by Bahasa Indonesia and Japanese.